Ashley Freiberg is working her way up through the racing world, currently racing for Fall-Line Motorsports in the IMSA Continental Tire SportsCar Challenge. She's 22, so please hold back on the BMW driver jokes. For 2013, Freiberg switched gears to focus on a future career in Sportscars. 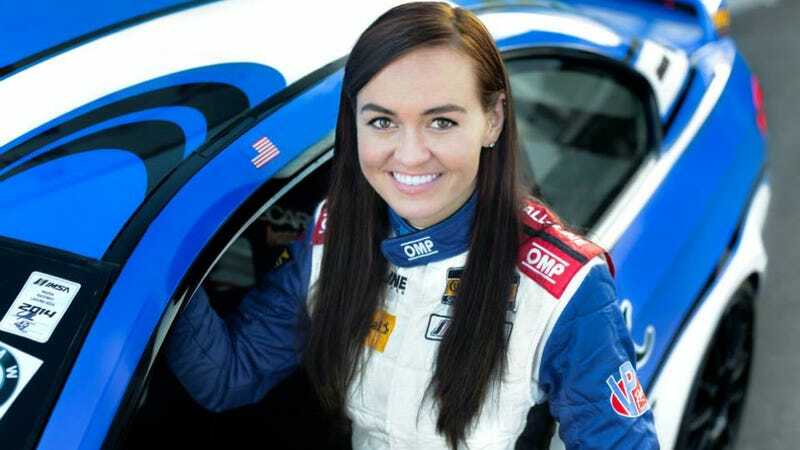 She joined sponsor EFFORT Racing in the IMSA GT3 Cup Challenge by Yokohama, quickly grabbing two top-five finishes in her debut during the season-opening Mobil 1 Twelve Hours of Sebring. She earned the Series' points lead after securing her first podium of the year with a second place finish in Race #1 at Mazda Raceway Laguna Seca in May to tie her for the championship points lead. The next race weekend at Watkins Glen Freiberg made history again by becoming the first woman to claim an overall GT3 Cup Challenge victory in North America with her win in race #2. The win also broke the championship tie, giving her the lead in the series championship point's battle by four points. The weekend would be her last races with the team as the two parted following a difficult weekend in Canada. Sports Illustrated Magazine named Freiberg a "Face in the Crowd" in 2013 and to stay fit for her racing, Freiberg explores the outdoors through rock climbing as told to espnW in a special athlete on-the-track feature. Rock climbing allows Freiberg to push her mind past her fear of heights, which helps give her the confidence to push the limits in her car while she is racing. Ask her anything you want!